With three ocean coastlines and more than three million lakes, water is one of Canada’s most precious and plentiful natural resources. Past research has demonstrated that time spent near water reduces stress and increases health and life satisfaction. A new Canadian study has found that living near natural water features, such as rivers, lakes, and the ocean, may actually lead to a longer life. The study, led by Dr. Dan Crouse, a research associate at the University of New Brunswick, and a team of researchers from across Canada, appears in the latest issue of Environmental Health Perspectives. In a similar study published last year, Dr. Crouse and his team found that exposure to urban “greenspace” in Canadian cities could reduce mortality rates by eight to 12 per cent. The purpose of Dr. Crouse’s most recent study was to examine whether living near large, natural water features, or “blue space,” might also be associated with reduced mortality rates. “We found much stronger associations than we had expected,” says Dr. Crouse. “We did not expect the effects to be as great as what we found with greenspace in our earlier study — let alone even greater than those.” Dr. Crouse and his team found that the risk of dying from several common causes of death was reduced by 12 to 17 per cent by living within 250 metres of water, compared to living farther away. The strongest protective effects were for deaths from stroke and from respiratory-related causes. They also found more protective associations among women and older adults. “It is difficult to say why we might see differences in the effects between men and women and among people in different age groups, but some of this would have to do with how different people perceive and engage with natural spaces,” says Crouse. The study followed a massive national cohort of 1.3 million Canadians living in 30 cities across the country over an 11-year period. The authors took into consideration personal characteristics of the subjects, including age, income, education, and family status, as well as socioeconomic and environmental information about the neighbourhoods and communities where they lived, such as local levels of air pollution and average household incomes. The findings from this study suggest that exposures to “blue space” in particular may have much stronger benefits to health than previously thought. Given that this is the first study of its kind, more research is needed to better understand the drivers of this relationship. 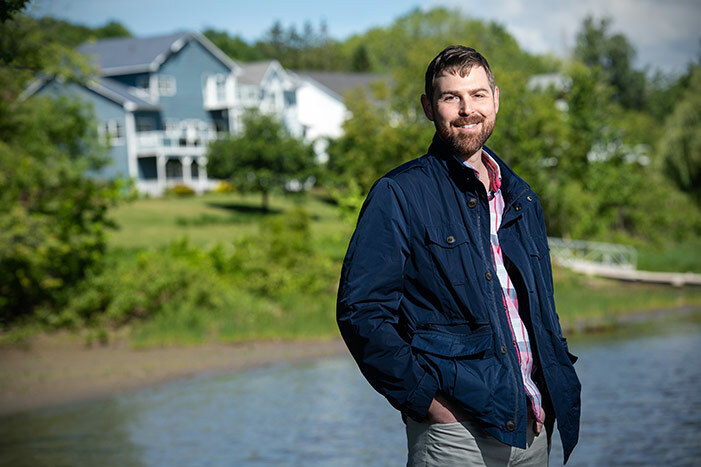 Photo: UNB research associate Dr. Dan Crouse has found that living near water may lead to a longer life. Credit: Rob Blanchard/UNB.